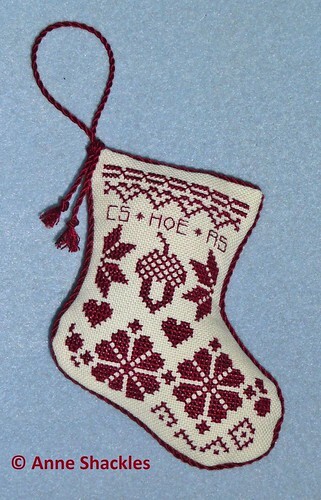 Anne S • This entry was posted in Christmas Ornaments, Cross Stitch, Exchanges, Finishes, Quaker, Tokens and Trifles and tagged Christmas Ornaments, Cross Stitch, Exchanges. Bookmark the permalink. The little stocking is really pretty. You did a great job with the finishing! I adore it! Your finishing is perfect! The stocking is beautiful! Congratulations on your finish!